Cerebral neurodegenerative disorders such as Parkinson’s disease (PD) and Alzheimer’s disease (AD) are increasing in prevalence as our population ages. In addition to progressively worsening neurologic symptoms such as gait abnormalities, tremor, spasticity, and memory deficits, many people with neurodegenerative disease also suffer from sleep complaints such as insomnia, excessive daytime sleepiness, or abnormal motor activity during sleep. The higher prevalence of sleep disorders in this population is not only secondary to the underlying neurologic symptoms, but also a consequence of damage to sleep-controlling regions of the brain, often affected in neurodegenerative disorders. For example, rapid eye movement (REM) sleep behavior disorder can present years or decades before any other neurologic symptoms or signs are present, and may serve as an early biomarker for neurodegenerative conditions such as PD or other synucleinopathies. Despite a growing appreciation of the significance of sleep in this population, sleep disorders frequently remain undiagnosed and untreated. 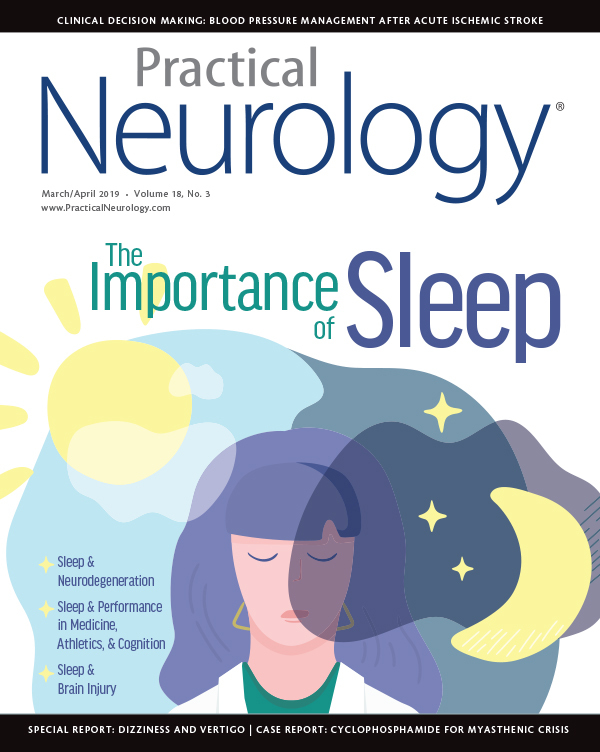 It is important for clinicians to recognize and properly manage sleep disorders because treatment may improve neurodegenerative disease symptoms and quality of life for both the patient and their caregivers. Sleep may also play a key role in the onset and progression of neurodegeneration. For example, there is growing evidence that poor sleep can accelerate progression of neurodegenerative disorders, such as AD, and may play a role in pathogenesis of the disease. Evaluation of insomnia requires a thorough history of an individual’s sleep schedule and bedtime habits. 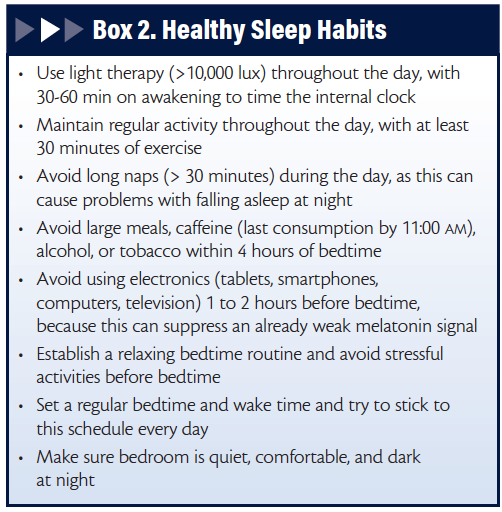 Using sleep logs, sleep diaries, or actigraphy can be helpful to collect this information. When insomnia causes daytime effects (eg, fatigue, irritability, mood changes, or worsening motor function), therapeutic intervention may be needed. Conversely, symptomatic treatment of motor and nonmotor symptoms in patients with PD improves sleep in this population.3 This can include treatments such as general optimization of the primary treatment regimen, or the addition of long-acting dopamine agonists (or transdermal preparations) before sleep. Patients complaining of insomnia should be asked about symptoms of restless legs syndrome (RLS), as this occurs in up to 20% of patients with PD,4 and can be treated by supplementing iron if levels are low or plasma ferritin is low (< 50 ng/L). In patients with moderate to severe RLS, clinicians can consider initiating dopamine agonists (eg, pramipexole) or α2δ ligands (eg, gabapentin) to help improve symptoms. Figure. Properly timed bright, dim light, and melatonin can advance or delay a person’s circadian rhythm. Light exposure in the green zone advances and locks in the sleep cycle. 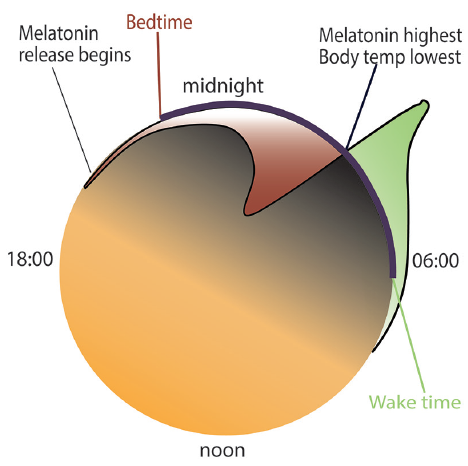 Light exposure in the red zone can disrupt the circadian system by suppressing melatonin and pushing the internal clock later. Hypnotic medications may be necessary under certain circumstances but should be used cautiously in this population because of increased falls and impaired cognition associated with their use. As in the general population, cognitive behavioral therapy for insomnia (CBT-I) is strongly suggested as first-line therapy for treatment of insomnia, although evidence for efficacy in this population specifically is limited. Sufficient data is also lacking regarding safety and efficacy of hypnotics in patients with synucleinopathies. Some studies have shown effectiveness of eszopiclone or doxepin in improving subjective impressions of sleep in patients with PD, but not objective measures of sleep.7,8 Other sedating antidepressants have been used clinically as well, but there are again concerns regarding side effects as well as the potential for worsening RLS or periodic limb movements of sleep. As in all cases, benefits of therapies must be weighed against risks. Patients with synucleinopathies may report abnormal movements during sleep, with REM-sleep-behavior disorder (RBD) being the most common parasomnia, occurring in up to 60% of patients with PD, or even higher in those with MSA or dementia with Lewy bodies (DLB). Consisting of complex motor behaviors, such as reaching, grabbing, kicking, or other vigorous motor activity that could lead to injury of the patient or bed partner, RBD occurs out of REM sleep. If awakened from the event, the patient will return to normal levels of consciousness, but may remember dream content related to the motor activity. In addition to a clinical history of dream-enactment behavior, RBD diagnosis requires attended polysomnography to demonstrate REM sleep without atonia, or increased muscle tone during REM sleep. Polysomnography is also helpful in this scenario to rule out other mimics (eg, periodic limb movements of sleep or sleep-disordered breathing) that can also cause movements during sleep. Seen not only in patients with synucleinopathies, RBD may predate onset of other clinical symptoms of these diseases by years or even decades. Studies following patients with idiopathic RBD have demonstrated high rates of conversion to PD and other synucleinopathies: 45% conversion rate at 5 years, 76% at 10 years, and over 90% at 14 years.14 Although the high risk of conversion to future neurodegenerative disorders is known, there is no proven neuroprotective therapy to delay or prevent onset or progression of these neurodegenerative diseases yet. Follow up typically involves a regular, detailed neurologic history and exam to look for early signs of disease. Initial therapy for RBD includes patient education about securing the home and avoiding injury to the patient or bed partner during an episode (Box 1). Treating any underlying primary sleep disorders such as RLS or sleep-disordered breathing should also be emphasized in order to prevent arousals that could precipitate an RBD event. Pharmacologic treatment of RBD is clonazepam or melatonin.15 Melatonin at high doses (9 to 15 mg nightly) improves RBD symptoms, with less potential for side effects. However, given the potential danger of RBD events, in particularly refractory cases, alternative treatments, such as sodium oxybate, may be required (see Update in Sleep Medicine Therapies in this issue). Insomnia and disrupted sleep at night are prominent features early on in AD. Some of these symptoms may be related to underlying circadian rhythm disorders that are caused by degenerative changes to the suprachiasmatic nucleus (master clock), as well as changes in melatonin release.17 Patients with AD who have circadian rhythm disorders tend to have prolonged wakefulness at night and consequently have sleepiness and naps during the day. Sundowning, with worsening behavior, agitation, and confusion at night is known to occur in this population as well, and may reflect the degeneration of normal circadian rest-activity patterns.18 Lack of daytime light exposure and decreased physical and social activities during the day (common in patients in nursing homes) ultimately exacerbate the underlying physiologic problem.19 Moreover, disrupted sleep and insomnia not only cause worsening daytime symptoms of fatigue, sleepiness, and confusion during the day, resulting in perpetuation of the dysregulation and disrupted sleep for caregivers, which can contribute to burnout. Patients with AD commonly have OSA because incidence of sleep-disordered breathing increases with age. If patients report symptoms (eg, snoring, witnessed apneas, daytime sleepiness, or disrupted nighttime sleep), further evaluation with attended polysomnography (or home sleep apnea test in appropriate subgroups of patients) is needed to confirm the diagnosis and classify severity. Treatment options include CPAP, weight loss, positional therapy, and mandibular advancing oral appliances. It has been shown that CPAP reduces subjective daytime sleepiness, decreases arousals, and increases stage N3 sleep in patients with AD and sleep apnea.24 Some studies show improved cognition and slowing of cognitive decline with use of CPAP in patients with AD.25,26 Adherence to CPAP therapy is the greatest challenge in patients with dementia given their cognitive deficits and confusion at night. Emerging research suggests sleep disruption of untreated OSA may lead to higher risk. or earlier onset, of dementia or mild cognitive impairment (MCI). Other studies suggest sleep disruption from any cause increases β-amyloid levels in normal controls, suggesting this as a factor in the progression to AD.27 This pathophysiologic link makes sense, because sleep may play a role in clearing toxic proteins from the brain. A majority (up to 60%) of patients with MCI have sleep complaints. Sleep studies in patients with MCI demonstrated more arousals during slow-wave sleep and increased wake after sleep onset.28 More studies are necessary to better understand the role sleep plays in the onset and progression of AD, and more importantly how improving sleep can prevent or delay dementia. Sleep disorders are commonly encountered in patients with neurodegenerative conditions, such as synucleinopathies and tauopathies. Sleep symptoms arise not only as consequences of damage to the central nervous system but also from medications used to treat the disease, and any comorbidities associated with these progressive conditions. Diagnosis and treatment of sleep disorders in this population may improve sleep, other symptoms from the underlying neurodegenerative condition, and quality of life. Sleep may also play a role in identifying patients at risk for future development of neurodegenerative disorders. For example, REM sleep behavior disorder may occur years to decades before other symptoms of PD. As we learn more about this patient population, there is hope that clinicians will have more tests available to better predict phenoconversion, and better yet, have agents to slow progression of the disease. Patients who are at high risk for synucleinopathies serve as an ideal patient population to learn more about how to prevent or delay disease onset. Similarly, in patients with AD, disrupted sleep may play a role in the early degenerative process or lead to acceleration of abnormal protein deposition in the central nervous system. As we continue to learn about the complex relationship between sleep and neurodegeneration, it may be that treating sleep disorders earlier in life may ultimately prevent onset of some neurodegenerative disorders later in life. 1. Tandberg E, Larsen JP, Karlsen K. A community-based study of sleep disorders in patients with Parkinson’s disease. Mov Disord. 1998;13(6):895-899. 2. Thorpy MJ, Adler CH. Parkinson’s disease and sleep. Neurol Clin. 2005;23(4):1187-1208. 3. Pierantozzi M, Placidi F, Liguori C, et al. Rotigotine may improve sleep architecture in Parkinson’s disease: a double-blind, randomized, placebo-controlled polysomnographic study. Sleep Med. 2016;21:140-144. 4. Ondo W, Vuong K, Jankovic J. Exploring the relationship between Parkinson disease and restless legs syndrome. Arch Neurol. 2002;59:421-424. 5. Breen DP, Vuono R, Nawarathna U, et al. Sleep and circadian rhythm regulation in early Parkinson disease. JAMA Neurol. 2014;71(5): 589-595. 6. Videnovic A, Golombek D. Circadian dysregulation in Parkinson’s disease. Neurobiol Sleep Circadian Rhythms. 2017;2:53–58. 7. Menza M, Dobkin RD, Marin H, et al. Treatment of insomnia in Parkinson’s disease: a controlled trial of eszopiclone and placebo. Mov Disord. 2010;25(11):1708-1714. 8. Rios Romenets S, Creti L, Fichten C, et al. Doxepin and cognitive behavioural therapy for insomnia in patients with Parkinson’s disease: a randomized study. Parkinsonism Relat Disord. 2013;19(7):670-675. 9. Hobson D, Lang A, Wayne MW, et al. Excessive daytime sleepiness and sudden-onset sleep in Parkinson disease. a survey by the Canadian Movement Disorder Group. JAMA. 2002;287:455-463. 10. Wienecke M, Werth E, Poryazova R, et al. Progressive dopamine and hypocretin deficiencies in Parkinson’s disease: is there an impact on sleep and wakefulness? J Sleep Res. 2012;21(6):710-717. 11. Trotti LM, Bliwise DL. No increased risk of obstructive sleep apnea in Parkinson’s disease. Mov Disord. 2010;25(13):2246-2249. 12. Neikrug AB, Liu L, Avanzino JA, et al. Continuous positive airway pressure improves sleep and daytime sleepiness in patients with Parkinson disease and sleep apnea. Sleep. 2014;37(1):177-285. 13. Ondo WG, Fayle R, Atassi F, Jankovic J. Modafinil for daytime somnolence in Parkinson’s disease: double blind, placebo controlled parallel trial. J Neurol Neurosurg Psychiatry. 2005;76:1636-1639. 14. Iranzo A, Fernandez-Arcos A, Tolosa E, et al. : Neurodegenerative disorder risk in idiopathic REM sleep behavior disorder: study in 174 patients. PLoS ONE. 2014; 9:e89741. 15. Aurora RN, Zak RS, Maganti RK, et al. 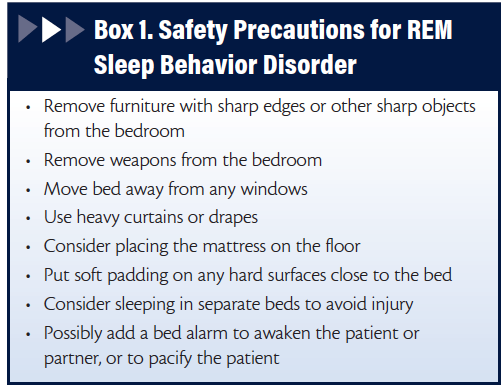 : Best practice guide for the treatment of REM sleep behavior disorder (RBD). J Clin Sleep Med. 2010; 6:85-95. 16. Bliwise DL. Sleep in normal aging and dementia. Sleep. 1993;16(1):40-81. 17. Mishima K, Tozawa T, Satoh K, et al. Melatonin secretion rhythm disorders in patients with senile dementia of Alzheimer’s type with disturbed sleep-waking. Biol Psychiatry. 1999;45(4):417-421. 18. Khachiyants N, Trinkle D, Son SJ, Kim KY. Sundown syndrome in persons with dementia: an update. Psychiatry Investig. 2011 Dec; 8(4): 275-287. 19. Hoyt BD. Sleep in patients with neurologic and psychiatric disorders. Prim Care. 2005;32(2):535-548. 20. Dowling GA, Burr RL, Van Someren EJ, et al. Melatonin and bright-light treatment for rest-activity disruption in institutionalized patients with Alzheimer’s disease. J Am Geriatr Soc. 2008;56(2):239-246. 21. Díaz-Gutiérrez MJ, Martínez-Cengotitabengoa M, et al. Relationship between the use of benzodiazepines and falls in older adults: a systematic review. Maturitas. 2017;101:17-22. 22. Takada M, Fujimoto M, Hosomi K. Association between benzodiazepine use and dementia: data mining of different medical databases. Int J Med Sci. 2016 Oct 18;13(11):825-834. 23. Camargos EF, Louzada LL, Quintas JL, et al. Trazadone improves sleep parameters in Alzheimer disease patients: a randomized, double-blind, and placebo-controlled study. Am J Geriatr Psychiatry. 2014;22(12):1565-1574. 24. Chong MS, Ayalon L, Marler M, et al. Continuous positive airway pressure reduces subjective daytime sleepiness in patients with mild to moderate Alzheimer’s disease with sleep disordered breathing. J Am Geriatr Soc 2006;54(5):777-781. 25. Troussiere AC, Charley CM, Salleron J, et al. Treatment of sleep apnea syndrome decreases cognitive decline in patients with Alzheimer’s disease. J Neurol Neurosurg Psychiatry. 2014 Dec;85(12):1405-1408. 26. Ancoli-Israel S, Palmer BW, Cooke JR, et al. Cognitive effects of treating obstructive sleep apnea in Alzheimer’s disease: a randomized controlled study. J Am Geriatr Soc. 2008;56(11):2076-81. 27. Spira AP. Gamaldo AA, An Y, et al. Self-reported sleep and beta-amyloid deposition in community-dwelling older adults. JAMA Neurol. 2013;70(12):1537-1543. 28. Beaulieu-Bonneau SC, Hudon C. Sleep disturbances in older adults with mild cognitive impairment. Int Psychogeriatr. 2009;21:654-666.